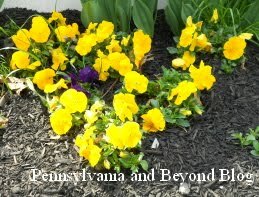 Pennsylvania is one of those mid-Atlantic states that can have extremely cold winters to severly hot and dry summers. At times, our weather can be warm and beautiful on one day, and then two days later it can be freezing cold. You either love the weather in Pennsylvania or hate it. This past winter was an extremely mild one for us and I am very grateful that is was mild, because I am not a fan of the Pennsylvania winters. This year on February 2nd, 2012, Groundhog Phil predicted 6 more weeks of winter. I am happy to report that this year, Groundhog Phil got his prediction WRONG! About two weeks after Groundhog Day our weather completely did a turn around. We warmed up and haven't had any severely cold temperatures, nor any type of snow or ice. Matter of fact, 2 weeks ago I had to run my central air conditioning for 4 days straight thanks to temperatures in the 80's. Wow, we never get 80 degree days in mid-March! Thanks to all of the mild warm weather the past few weeks all of our flowers bloomed early. We have had all of our favorite springtime flowers blooming since about the second week in March. yeah! We usually don't see our daffodils and tulips blooming like this until mid-April so we are totally enjoying this mild weathered spring this year. 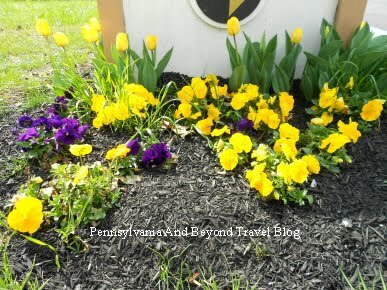 Our photos for this week are 2 that I took on Sunday of some blooming springtime flowers. Aren't they pretty? I love them! I am so thankful that Groundhog Phil was 100% incorrect on his predictions this year!